Customers seeking specialized roll up shutter repair services in York and the Greater Toronto area rely on ROLLerUp. Our company supplies expert roller shutter repair assistance to commercial and residential clients. We offer the skills of dependable, fully trained technicians. If your business or residence relies on roll up shutter technology, you realize these easy maintenance products break down infrequently. Strong metal shutters contribute to privacy and property security. Yet since every device will eventually experience some deterioration necessitating repair services, customers appreciate the availabiity of ROLLerUp. We remain available to respond to requests for fast roller shutter repair assistance in Toronto, ON. Contact us first whenever you discover any problem requiring skilled security shutter repair services. We serve a wide coverage area. Obtaining complete customer satisfaction remains our chief mission. We also offer shutter inspection and maintenance services for your convenience. Call us whenever you experience a problem requiring knowledgeable security shutter repair services in Toronto, ON. 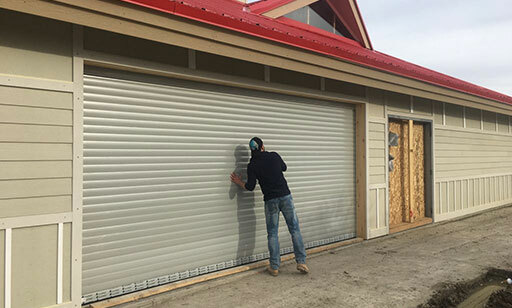 Whether your roller shutter repair request stems from an accident, vandalism, or simply the impacts of high winds and inclement weather, we provide dependable, knowledgeable roller shutter repair services in Toronto, ON. Our technicians possess experience servicing most popular brands of rolling shutters in Toronto, ON. Our company assists customers throughout York and the Greater Toronto Area. (If you don't know whether your location lies within our coverage zone, simply contact us. If we cannot assist you, we may refer you to a repair firm in your local area.) We strive to help keep roll up shutters in excellent working condition. Today a growing number of businesses and households appreciate the convenience, privacy and security offered by fashionable roll up shutters. We hope to become your first choice whenever you require repair or maintenance assistance for these products in this region. Contact us today to schedule a roll up shutter service appointment!